In stead of talking about added value, should we talk about loved value? How to define, how specific services bring us such a happiness and a good feeling, that we want to use it again? Is it intuition that service designers should trust more? Solita, a Finnish digital business consulting and services company, opened up their service design ideas to the public in Solita HUB Goes Design event on the 26th of May. 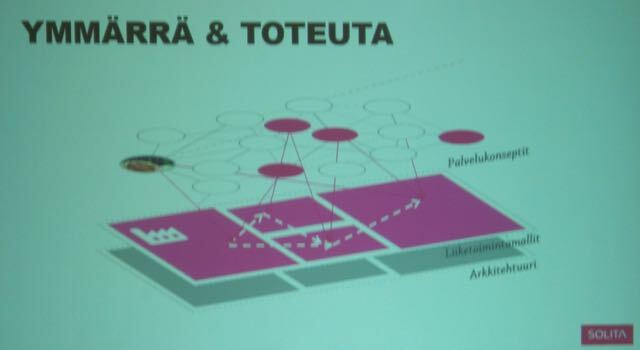 This event was placed in Lasipalatsi, Helsinki. Minna Pinola, the Director of Marketing and Communications at Solita, started the event. 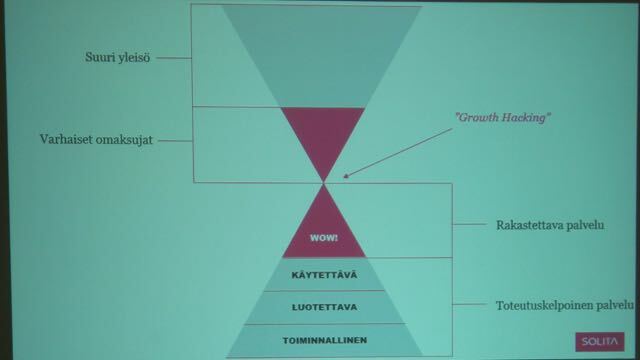 She presented the company and how its 350 people are located in Helsinki, Tampere and Oulu. Solita is already 18 years old and has concluded over 75 projects in the past. She stated that their idea is to create something new and better businesses and services with customers, and offer solutions to digital business and enterprise information management. In order to make great service design, it is important to understand the customer and how they act. Solita underlines the meaning of empathy. According to Riikka Pasanen, Principal Consultant of Solita, identifying critical touchpoints and added value in the service process is important in service design. She pointed out that customers care mostly about the brand and how the service works, they don’t distinguish services between digital ones and non-digital ones. If something seems to make customers happy, we should emphasize it! Make things easier for the customer. She presented shortly their various methods (see picture 1) and emphasized the importance of prototyping and testing in real contexts. She also pointed out that service design doesn’t work alone and is never ready. It must be supported my customer analyses and surveys as well as continuous iteration and development. 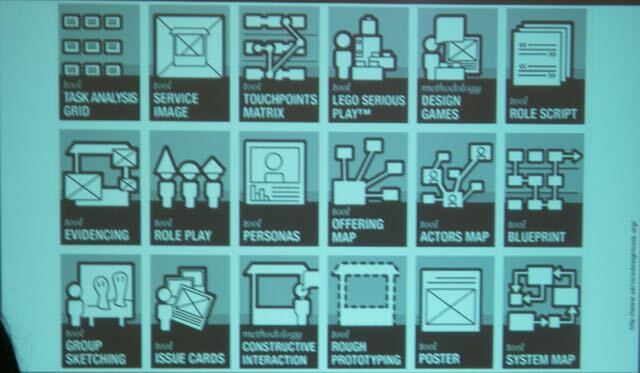 Co-design and ideation in workshops is common in Solita. They have noticed that doing together and asking the personnel is the best way to commit and create a common memory to all the people involved in the service design process. This interaction prospers innovative ideas. Customers can be asked for their opinion, as Solita does directly through Facebook. I see this as a very open way of communicating. Mikko Väätäinen, Business Designer in Solita (picture 2), pointed out that amazing service experiences have good service design behind them. From the point of view of the customer service offering might seem chaotic. A well planned concept, business model and architecture makes the service differ from others (see picture 3). 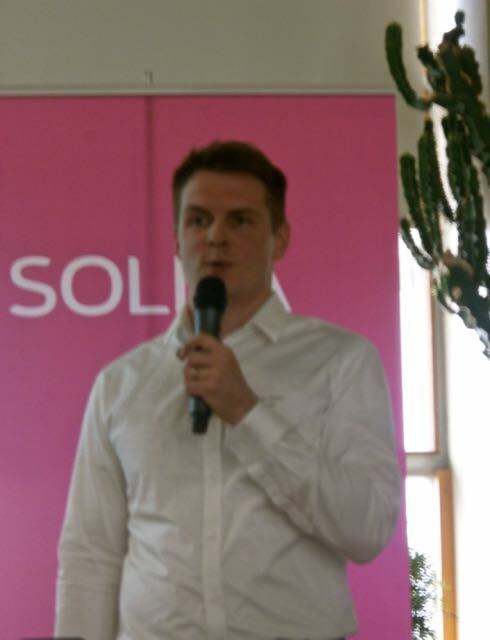 Lassen Tammilehto, Senior Consultant in Solita, talked about feelings. He pointed out that customer experience is mostly based on feelings, not rational thoughts. These feelings should be supported by positive signals and great service design. This is something rather simple to say but not always so easy to remember. The talk about bad experience spreads like an epidemic. Companies should remember that it is the “moment of truth” which designates the decision to buy or use the service. Take care of your customers and develop yourself to their processes. After talking about feelings, Tammilehto talked about “Minimum Lovable Products”. The service must be lovable, it is the tie between the brand and the customer. A loved service differs from others. It made me think that when people love the service, they want it to continue, they start co-working and want your service to prosper and develop. I think he’s right, love commits. If you offer something plain, feelings are more neutral which is almost as bad as negative feelings. It is not enough to have a “Minimum Viable Product, MVP” or service which is enough and serves its purpose, it must make people fall in love with it. These MVP’s are commonly created when there is a strong time pressure and an urge for quick results. This way the quality might suffer. Anyway, why hurry, if with a little patience and good prioritizing the service gets more customers? Making products lovable is important especially in the digital service contexts as the range of offers and competition is so huge and unpredictable. When thinking about personal service context, the competition is stronger in cities as there are usually more rivals. Well planned service design brings more results. Picture 3. Model of a Minimum Lovable Product by Tammilehto L.
Lasse Tammilehto presented a model of this idea of a lovable service (picture 3). In order to win the early adopters and finally the big audience, the service must be usable, functional and reliable, which make the basis of a sufficient service. In the top is the WOW-effect which is needed for the service to be loved. Tammilehto showed a result by Google according to which the first 50 milliseconds determines whether the customers believes a service is reliable or not. According to Jere Käpyaho, Senior Consultant, digital services should be always mobile or they are out-of-date already in the beginning. Right amount of right information on the right screen is important. He states that “context is the king!” in mobile services. Services are a bundle of service pieces and a service designer has to be able to make them match in many flexible ways. Developing a lovable, easy, positive service to the right people in the right time is important. Mobile services, feelings and usability must feel easy. If using a service is complicated to use, customers don’t fall in love with it.